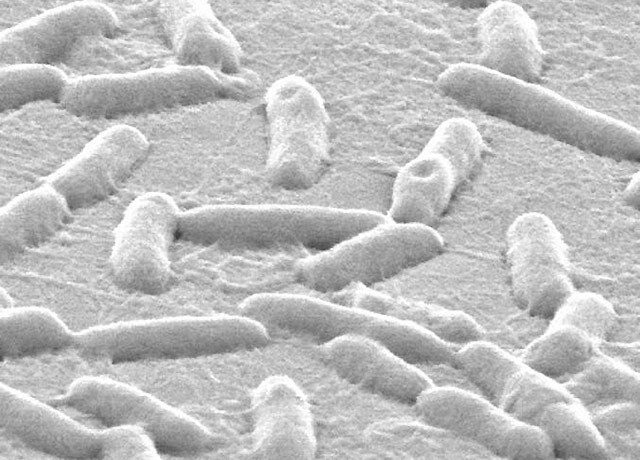 In studies in humans and mice, bacteria confuse the metal gallium for a nutrient, and it works as a Trojan horse to destroy them. Scanning electron micrograph of pseudomonas bacteria growing on plastic. This side-view x-ray shows a pseudomonas infection at the top of the lung. It appers as a torn shroud with black cavities. The work is described in the Sept. 26, 2018, issue of Science Translational Medicine. The two primary investigators, Pradeep Singh and Christopher Goss, are faculty members at the University of Washington School of Medicine. News coverage includes VOA, KJZZ Radio, Fierce Biotech, Long Room.